The Greek beat-head massive is represented once again on the Cold Busted label with Beatbop Street. It’s an album from the cool new project AndyFellaz, a collaboration of Athens-based producer Billa Qause (Beatquick) and percussionist Nikos Martziokas (Wolfy Funk). Influenced by ’90s hip hop, trip hop, Latin montunos, jazz, and lounge, the pair have delivered fourteen exciting cuts that groove and shimmer with the best of ’em. Highlights include the melancholic skank of “Just One More Time”, “Rumbetas”’s classic acid jazz style, the funky swing of “Two Weirdos”, and “Madrugada”’s dreamy cosmic salsa. The set also includes contributions from Wolfy Project’s bass player Konstantinos Stamou, as well as Yegor Cergei who reveals an elegantly cut-up remix of “Just One More Time”. 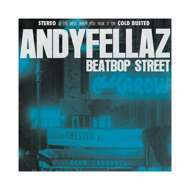 Beatbop Street will satisfy the hip hoppers, the loungers, the jazzers … pretty much any fan of funky downtempo will be convinced by AndyFellaz. Dig it.